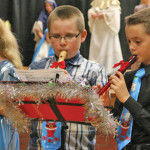 Grade 4 students perform “Away in a Manger” on their recorders at the Burdett Christmas concert. 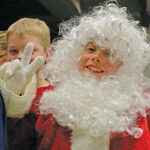 This young Santa Claus sends peace after the Bow Island Elementary/Senator Gershaw Christmas program. 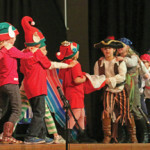 The elves and pirates in the Foremost School’s “A Pirate Christmas’ perform a give-and-take routine.